Dave joined the Ambassador team in early 2015. Dave was drawn to Ambassador by the firm’s faith-centered values and the client-focused philosophy. Dave graduated from Drexel University with a B.S. Civil Engineering, and has been in the financial industry since 1999. Prior to his time at Ambassador, Dave spent time working in Philadelphia, on the PHLX (Philadelphia Stock Exchange) and New York City on the New York Merchantile Exchange where he traded Energy, Metals and Soft Commodities. In his work as an Advisor, Dave strives, first, to listen to the goals and objectives of his clients. 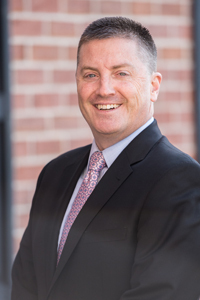 Dave then uses his expertise to match client priorities with tax-wise strategies in the areas of wealth management , retirement income generation and estate planning. Dave’s clients appreciate the personalization he brings to the planning process, as well as his ability to explain the often-complex aspects of finance. Dave resides in Lancaster with his wife, Peg, and three sons. Dave and his family are members at Calvary Church. Dave enjoys golfing, playing baseball with his boys, serving as President of the Manheim Township Wrestling Boosters, as well as coaching Manheim Township’s Youth Wrestling.